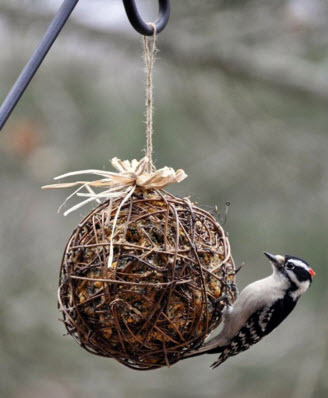 Turn a grapevine ball into a suet feeder for your neighborhood birds! Get a grapevine ball and wrap it with plastic wrap. Cut a hole in the plastic wrap and scoop suet into the ball. Cover the hole with more plastic wrap, then put it in the refrigerator. Once the suet has hardened, remove the plastic wrap and hang the feeder from a tree branch.